Alanna Demetrius | The Phoenix Loyola sophomore center Cameron Krutwig fends off a UMKC defender. 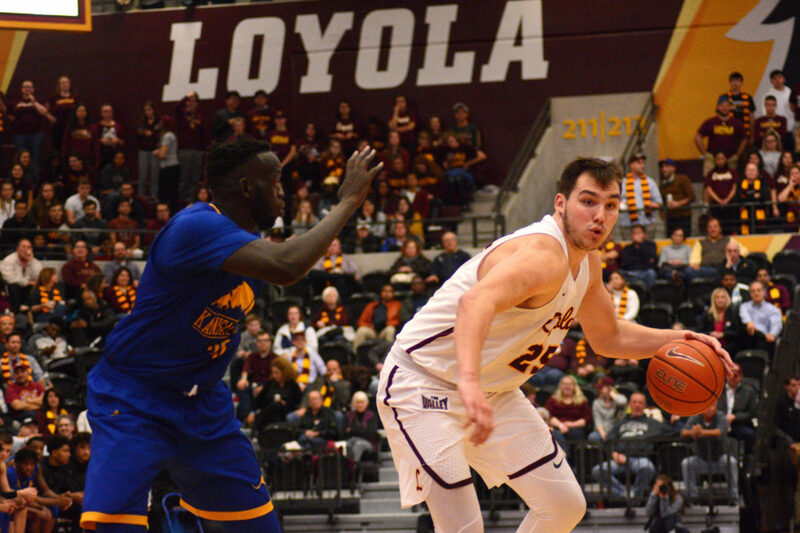 The Loyola men’s basketball team (4-3) fell 79-65 to No. 5-ranked University of Nevada in front of a sold-out crowd at Gentile Arena Tuesday night. 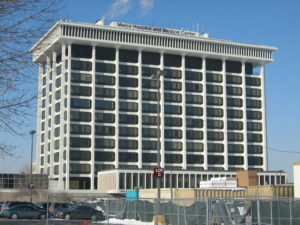 The game was a rematch of last year’s NCAA Tournament Sweet Sixteen, when the Ramblers defeated the Wolf Pack 69-68 on a last-second three-pointer by Marques Townes. Nevada head coach Eric Musselman said the team came in looking for revenge after the loss back in March, but the players were nervous after traveling straight to Chicago from two games in Las Vegas. The Wolf Pack’s field goal percentage never dipped below 50 percent as they went 32-for-55 from the field, including 6-for-14 from three-point territory. Redshirt senior forwards Caleb and Cody Martin led their team in points with 21 and 20, respectively. Senior guard Jordan Caroline had 15 points and Trey Porter scored 14 to round out the scoring. Loyola head coach Porter Moser said Nevada was tough to defend due to the height of its players. Nine players on the Wolf Pack’s roster are six-foot-seven or taller, which made it hard for the Ramblers to match up against since their tallest player is six-foot-nine. The Ramblers couldn’t seem to gain control of the game, despite their increased offensive presence in the second half. Loyola hit 39.3 percent of its shots in the field in the first half and 46.9 percent in the second half. Townes said the loss can be attributed to the Ramblers coming out flat at the beginning of the game, a trend Loyola has followed so far this season. Townes led Loyola in scoring with 24 points on 9-for-19 shooting. He also added 9 rebounds — seven of which were defensive rebounds. First-year guard Cooper Kaifes came out strong in the second half and created some much-needed action for the Ramblers. While he only scored 11 points, he went 4-for-7 from the field and hit two of five three-pointers to try and get the Ramblers back in the game. Despite the offensive in the second half effort put up by both Townes, Kaifes and sophomore center Cameron Krutwig, the team was unable to pull forward and fell to the Wolf Pack 79-65. After the game, Moser said sophomore guard Lucas Williamson suffered a hand injury and went for X-rays to be further evaluated. The Ramblers are scheduled to make the short trip to the West Loop Dec. 1 to take on University of Illinois at Chicago. Tip-off is scheduled for 3 p.m.
After scoring 19 pts against UMKC, Cooper Kaifes has seldom been used. Why? He could have been the difference in our losses to Furman and BC. Had he played more against Nevada and kept his hot hand the outcome may have been different. Uguak has demonstrated that he is not ready for prime time yet he keeps getting excessive playing time. Kaifes is the answer for out lack of height under the boards—use him!